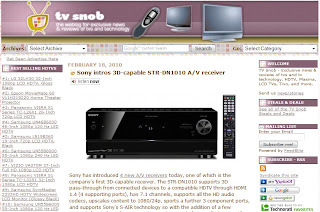 BLOG DESCRIPTION: TV Snob - The weblog for exclusive news & reviews of tvs and tv technology. MY REVIEW: I’m not interested in the technological aspects of television myself, but if you are, you’ll probably enjoy TV Snob. It’s published by the same people (Blogpire Productions), who publish Candy Snob, but the difference is this one is updated on a daily basis. It is updated Regularly (Unlike other Blogpire Blogs). If you are in to entertainment technology, this is the blog for you. These are simply reviews of different TVs and Accessories (No personal insight). Same stuff you will find on the internet, but compiled in one spot. •JVC media player eats SD cards and that’s it. •Netflix Watch Instantly going 1080p, 5.1-channel surround sound.